We hope that students of Astrology will find this page–where we offer a range of Astrology resources (including links)–handy and useful. Here are our descriptions, comments, and hand-picked, recommended links to superior Astrology software, books, magazines, conventions, online chart calculation services, and more. Description: Besides free reports, Astrodienst offers a fantastic chart calculation service (also free). Plenty of options are available, and the service is very easy to use. The Free Service: This is arguably the best free online chart calculation service. On their “Free Horoscopes” page, if you scroll down to the “Chart Drawing, Ascendant” option, you’ll be able to input birth data and let the program draw up your chart for you. If you create a free account, you can save and access up to 100 charts online in “My Astro” at the site (you simply need to enter your email address and set up a password). Excellent! If you are an intermediate or advanced student of Astrology, don’t miss their “Extended Chart Selection” option. This allows you to tweak your chart by choosing from different house systems, adding asteroids and various points to your charts, etc. 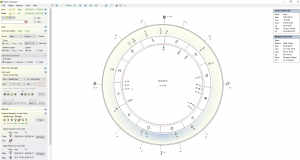 You can also create composite charts, transits and progressions, and more here. Different chart styles can be selected, and there are also grids and the like. Outstanding! Go to the Astrodienst Chart Calculation page. For chart calculations, use the “Chart Drawing, Ascendant” link; for more choices, use the “Extended Chart Selection” link. Description: 3200 Years Ephemeris. Users can click on any year and view the ephemeris pages in .pdf format. For personal use only. The Ephemerides: Very easy to use – a handy reference. I use these pages often enough, although I do prefer a hard-copy ephemeris (see below). You can print out the pages if so desired. This is the nicest online ephemeris I have found. Go to the Astrodienst – 3200 Year Ephemeris page. The Ephemeris: This hard-copy ephemeris is a must-have for astrologers. Even though ephemerides and chart calculation programs are available online at no cost, there is nothing quite like the ability to pick up a book and do a scan of the upcoming transits and planetary positions! Of the ephemerides available, I prefer this one. It’s easy to use and reliable. Two versions are available (both are for the years 2000-2050)–one for positions calculated at Midnight, and one for Noon. For more information, user reviews, and to buy: The American Ephemeris for the 21st… . Astro DataBank, featuring Lois Rodden, offers a large collection of famous people’s birth data online. Excellent for those interested in research. One of the many features of the AstroPro site is “Horoscopes of the Famous and Infamous”. Each month, Richard Nolle offers free charts of famous people, collected from a variety of sources (listed). Birth charts are only available for birthdays in the current month, but data is available for year-round birthdays. Very handy! Go to the Astropro Celebrity Data page. At the Matrix Software site, one of their features is the Celebrity Astro*Search, which is a searchable database for 30,000 famous people’s birth data and famous events. Search by name or birthday. Go to the Matrix’s Celebrity Astro*Search page. For a list of astrological get-togethers around the world, go to the Cosmic Connections section of the Dell Horoscope Magazine site. There you’ll find lists organized by location. The AFA offers convention details, registration forms, and so forth for their conventions. Go to the AFA site. Hank Friedman’s “Ultimate Guide to Astrology Software” at Soul Healing includes links to Hank’s weekly weblog on the latest news about astrology software, his published software reviews, “Optimal Use of Astrology Software”, how to download free demos of professional programs, links to free software, frequently asked questions about astrology software, a growing number of free video and text tutorials, and more. See the Ultimate Guide to Astrology Software by Hank Friedman at Soul Healing. 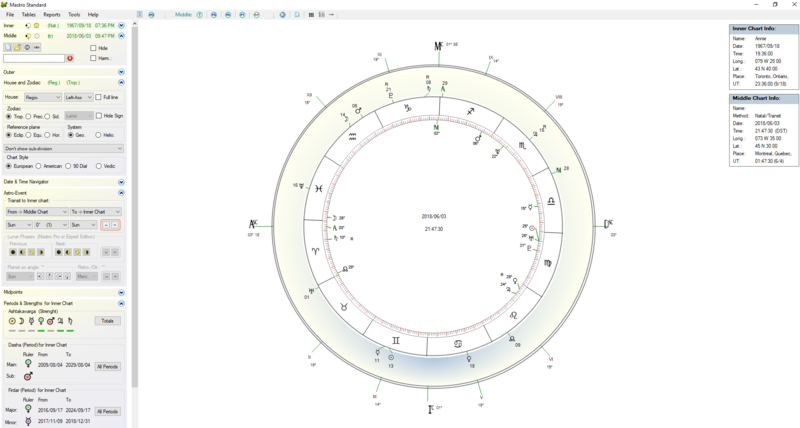 This astrology software program by Halloran is brilliant. It does pretty much everything you want an astrology software to do, has a beautiful suite of astrology report options, and allows you to create your own reports as well. Recent additions to the report options include well-researched interpretations of Aspect Patterns, declination aspects, Black Moon Lilith, the Nodes, and minor square aspects. This is a favorite, go-to software. We use this software for generating many of the reports sold on Cafe Astrology. Description: Solar Fire Gold is an excellent, extremely capable astrology software program for basic through advanced calculations, and is available through AstroLabe and Esoteric Technologies (Australia). Go to the Astrolabe site or the Esoteric Technologies site. Description: The Software: Although I don’t currently own Win*Star, I did have its predecessor, Blue Star, and was thoroughly pleased with it (of course, that program is outdated now, but it was great in its time). I’ve used the demo, and I also have found Matrix gives excellent support and customer service. Win*Star is loaded with features for the professional and advanced student. Go to the Matrix site. Description: Kepler provides interpretations and analysis of individuals, relationships, and future trends. The information is in plain English so you can understand it, and uses the latest, most sophisticated astrological analytical techniques to provide accuracy. Kepler also provides a huge number of technical calculations for the advanced or professional astrologer. The Software: Massive options and features. This is one of the best charting software programs for the professional astrologer, astrology researcher, and for beginners who are interested in running the company’s report writers. We use Kepler for charts generated on CafeAstrology.com. Go to the Cosmic Patterns site for a complete rundown of the program’s offerings. The Software: This is sort of the “baby” program of Win*Star. It is less expensive, and of course, has less options than the big program. However, some Astrologers, and students of astrology, will find it handy and sufficient for their needs. Sometimes even the professional astrology software programs don’t include some cities and towns in their atlas. For longitude/latitude lookups of the more obscure cities and towns, try this fabulous online tool for finding latitude and longitude. The free version of this clever software has a wonderful and interactive interface that most astrologers and students of astrology will love. With this program, I especially love how I can look to the past or ahead at transits quickly and easily. For example, with transits (middle wheel) to my chart (inner wheel), I can actually drag transiting Mars to the position of my natal Moon and the transit chart will hop ahead to the date in the future this will occur. If I toggle the direction to “backward,” I can drag transiting Mars back to my Sun and the chart will change to the date in the past when this occurred. I will be looking into the other levels of this software (pro and expert) shortly. Read more about and download the free Mastro software. Description: This is a free downloadable chart calculation program that runs on multiple platforms (Windows, DOS, Mac, and UNIX) with plenty of features. The Program: Astrolog works–and it’s free! It’s terrific. You can create standard charts, bi-wheels, and more. It calculates the positions of Chiron, the 4 main asteroids, True and Mean Nodes, the Vertex, Part of Fortune, East Point, 8 Uranian Planets, Lilith, Fixed Stars, and Arabic Parts. You choose the House System (from a choice of 14 systems); get parallel/contraparallel data; and a lot more. There are also aspect and midpoint grids and lists, transits and progressions, synastry and composite charts, some interpretations of aspects and positions, Gauquelin Sector wheel option, and more! Recommended. Go to the Astrolog site. The Software: This is sort of the “baby” program of Win*Star. It is less expensive, and of course, has less options than the big program. However, many students of astrology will find it handy and sufficient for their needs. Description: Time Passages software offers different levels of programs for calculations and interpretations, priced right. Description: Here you can find a list of the top-selling Astrology books as well as new and expected releases. Books often are reviewed, described, and reviewed by users. This book seller: Plenty of Astrology books can be found here. However, many excellent astrology books go out of print, and although Amazon has links to used books, I tend to run searches for the books I want in the other “used and new” online bookstores mentioned below. Description: Both new and used books are available side-by-side in-store, and in the online store. Huge selection of new, used, rare, and out-of-print titles. This book seller: As a lover of books, I had the most awesome bookstore experience during a visit to Portland, Oregon, which is home to Powell’s Books. The company now has a number of physical stores and warehouses, and Powell’s City of Books is truly a landmark — a massive building filled with bookshelves that stock both new and used books alongside each other. Powell’s online selection is equally as awesome. This is the site to go when you are looking for Astrology books on a large variety of topics, in new or used condition, and for rare and out-of-print titles. Go to the Powell’s Books General Astrology Book Store. Description: Online auctions with a huge selection of products. This service: There is an excellent system set up at eBay that lets users know about a seller’s (and a buyer’s) history at eBay. Many sellers accept PayPal, which is a convenient way to send an instant payment that is secure and easy, and you are usually able to pay with Visa and Mastercard as well without handing over your credit card information to sellers. While bidding on auctions is great fun, many sellers have “Buy it Now” options next to their goods. This allows people to make a purchase right away without waiting and bidding on something they really want. eBay is addictive. It’s a great place to find used (and new) Astrology books and products. Of course, if you’re willing to become a seller, you can unload some of your own used items here. See our list of free astrology books available to read online. The Magazine: Best for intermediate to advanced students of Astrology. Everything from mythology and zodiac to relocation and horary astrology is covered in this well-respected magazine. The Site: TMA makes some of the magazines’ articles available online. Go to the Mountain Astrologer site. The Magazine: Best for beginning to intermediate students of Astrology. I enjoy the feature articles the most, although some people fully appreciate the forecasts and planet data as well. The Site: Offers some nice features, like a sun sign daily forecast (with monthly highlights), and a great “Cosmic Connections” section that lists astrological get-togethers (conventions, etc.) around the world. Go to the Dell Horoscope site. Hank Friedman offers 100+ free tutorials in Western and Vedic astrology at Soul Healing. Aspects in Astrology: A Guide to Understanding Planetary Relationships in the Horoscope by Sue Tompkins. This is an excellent guide to aspects. Very readable and insightful. Planets in Aspect: Understanding Your Inner Dynamics (The Planet Series) by Robert Pelletier. At Astrodienst’s web site, the alternative interpretations in the free natal chart reports are culled from this work. Planets in Transits: Life Cycles for Living by Robert Hand. Cookbook-style, thick book. Great reference. The Gods of Change: Pain, Crisis and the Transits of Uranus, Neptune and Pluto (Arkana’s Contemporary Astrology Series) by Howard Sasportas. The transits of Uranus, Neptune, and Pluto. Read our review of this book for more information. The Changing Sky: A Practical Guide to Predictive Astrology by Steven Forrest. Predictive Astrology: The Eagle and the Lark by Bernadette Brady. Excellent tools for organizing and understanding progressions, transits, eclipses, saros cycles, and more. See our review of this book for more information. Astrology for the Soul by Jan Spiller. Thorough and insightful treatment of the Nodal Axis of the Moon. Read our review of this book for more information. The new Knack Astrology: A Complete Illustrated Guide to the Zodiac by Molly Hall is beautifully written with a gorgeous, intuitive layout. Astrology, Karma & Transformation: The Inner Dimensions of the Birth Chart by Stephen Arroyo. An excellent work that deals with transits and cycles, planetary aspects, karmic relationships, the Ascendant and Midheaven, and more. Saturn: A New Look at an Old Devil by Liz Greene. Outstanding analysis of Saturn by house, sign, aspect, and in synastry. Read our review of this book for more information. The Twelve Houses (Aquarian Astrology Handbooks) by Howard Sasportas. Comprehensive work that focuses on the meanings of the houses. Planets through the houses, plus Moon’s Nodes and Chiron. Chart Interpretation Handbook: Guidelines for Understanding the Essentials of the Birth Chart by Stephen Arroyo is a classic that explores the signs, elements, planets, and a whole lot more. Planets in Synastry: Astrological Patterns of Relationships (The Planet Series) by E.W. Neville. Analyzes aspects in synastry as well as in the composite chart. Very recommended work. Relationships, Astrology, and Karma: How to Understand, Transform and Heal Your Relationships Through Astrology by Pauline Stone. This out-of-print book is a little difficult to find, but it’s a gem. Essential for understanding the outer planets’ role in synastry. The American Ephemeris for the 21st Century 2000-2050 at Midnight by Neil F. Michelsen. Very easy to use and handy. Students of astrology, be sure to visit our recommended astrology books page, and our used astrology books page where we share sources for finding out-of-print, used, and rare books on the subject. So many excellent astrology books and manuals are now out of print! While the site earns a small commission that helps keep the site going for referring customers through these links, I only include items that I truly recommend.